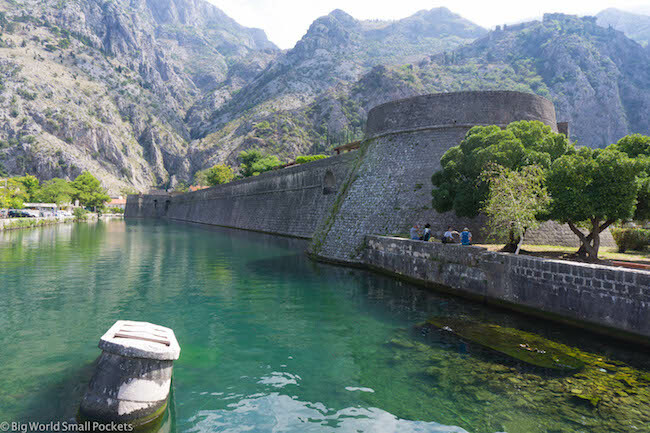 Let’s be clear here peeps, you need to get to Kotor in Montenegro and you need to do it soon! For while this gem of Adriatic beauty has been discovered by travellers, it’s not yet overrun with them. However, if nearby Dubrovnik is anything to go by, it soon will be! For Kotor is every bit as ideal as Dubrovnik – an UNESCO-listed fairytale-like Old Walled City that sits above the dazzling, aquamarine ocean and is surrounded by a wall of picturesque mountains. But the secret is that it’s still half the price of its Croatian counterpart and, while Montenegro’s euro currency does make a trip here a little more pricey than nearby Serbia or Bosnia, it’s still an absolute steal given the quality on offer! 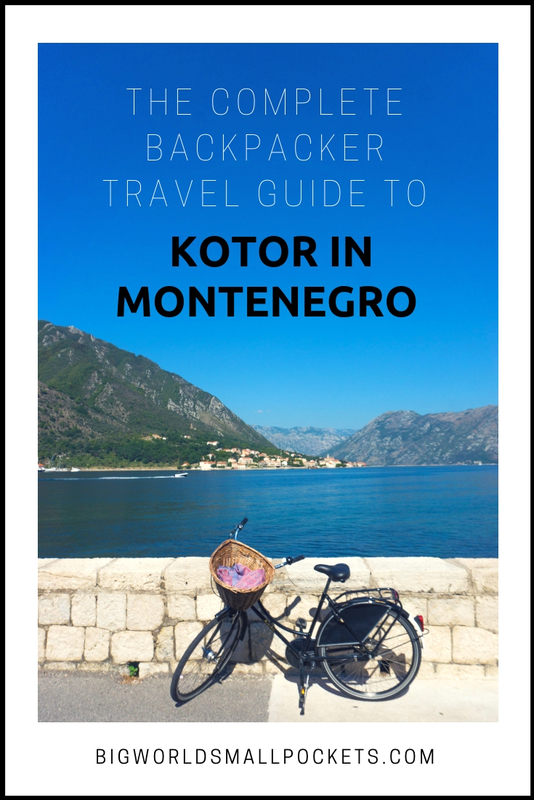 Yup, there’s no question that Montenegro was one of the highlights of my Eastern Europe summer adventure and here’s my complete backpacker travel guide to Kotor to help you plan your trip there ASAP! One of the great reasons Kotor makes a great budget travel destination is because it’s easy to get to from lots of different directions and in lots of cheap ways! International airports can be found in Montenegro’s capital Podgorica or just outside nearby Dubrovnik in Croatia. Both boast budget airline flights from destinations around Europe care of companies such as Ryan Air and WizzAir. As both airports are roughly a 2-3 hour drive away from Kotor, it doesn’t make a huge difference which one you fly to (the only slight thing to consider is the border crossing if flying into Dubrovnik). As such, I suggest checking Skyscanner to see which airport boasts the best deals, picking that one and then hopping on a local bus to Kotor. Alternatively, if you’re already travelling in the Balkan / Eastern Europe area, then cheap buses can be found from nearby capitals and cities including Mostar in Bosnia, Skopje in Macedonia and Tirana in Albania. The website www.busticket4.me is a great resource for backpackers travelling to and from Kotor as you can book online bus tickets from range of local companies – a godsend in an area where neither Eurolines nor Flixbus seem to operate. 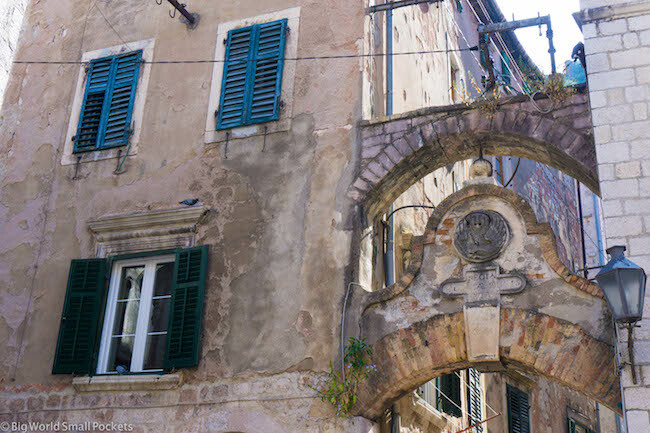 Once in Kotor, you’ll be delighted to know getting around is super cheap and easy. That’s mainly because it’s undertaken using your own 2 feet! Yes, Kotor really is a small place, and with the bus station situated just outside the walls of the Old Town, many accommodation providers located close by, and waterfront swimming possibilities – as well as shops, restaurants, bars, cafes etc scattered in and around the Old Town – there really isn’t any need to navigate Kotor any other way than walking. The exception is if you want to head out to explore other parts of the Bay of Kotor, such as the village of Perast, which sits further along the inlet’s coastline. I’ve written more about Perast in the day trip section of this article – but it’s worth knowing the both bus and bike transport to a range of other towns in the Kotor area is totally possibly and very cheap. I was in Kotor during early September and it was perfect – the weather was still delightful and the ferocious crowds of peak summer season had dropped away. Cruise boats also seemed to be less visible and I only witnessed 1 during my 4 days in Kotor. As such, I’d say June and September would be the best months to visit Kotor to ensure the weather and views, but minimised crowds. July and August will be hot and busy, but fun. April / May and October may be a little cool for swimming if you’re a softie like me, but good for sightseeing otherwise. Winter will be wet and cold! 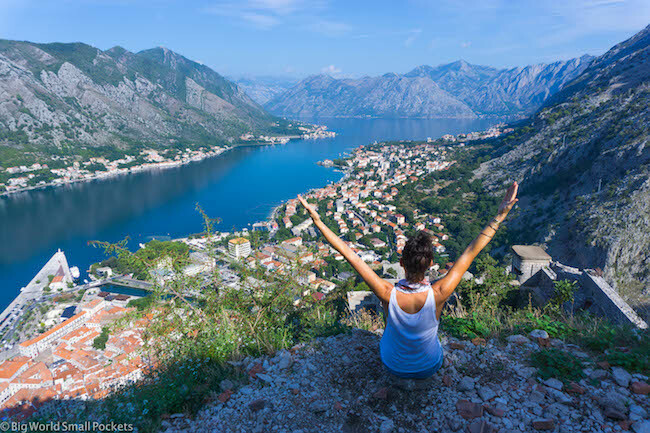 #1 Good Camera – You will be pretty much snapping non-stop in Montenegro and will need a good camera to do this gorgeous destination justice. I highly recommend the Sony A6000, which I use for all my travels and which I love not least because it’s light, compact and robust! #2 Good Walking Shoes – There will be a lot of walking in Montenegro, it’s as simple as that! Make sure your feet are comfortable therefore with a pair of New Balance Trainers. Perfect for city strollling, cycling or hiking, I love mine! #3 Good Guidebook – I’m still a massive fan of the Lonely Planet Guidebooks and do think their Montenegro edition is well put together and able to save you a lot of money if you want to learn about the history of this country, but not continually pay for guides! #4 Good Water Bottle – Montenegro gets seriously hot in the summer, so make sure you have a metal water bottle that you can refill as you go, because the tap water here is drinkable… and free! #5 Good Backpack – And to carry your water bottle, camera and guidebook, you’re going to need a decent backpack that will help you balance the weight as you travel. In my opinion you can’t go past the Bobby Anti Theft Backpack, which is also perfect for helping you avoid pickpockets too. One of my favourite things about Kotor in Montenegro is that it’s the sort of place where there’s both a huge amount to do and simultaneously nothing much at all. The perfect travel combination if you ask me! What I mean by this, is that one of the best things to do in Kotor, is simply to wander around, soaking up the beautiful streets and ambience of the Old Town, framed by the dazzling waters of the Adriatic sea and gawping at the mountains which rise steeply from the crystal blue at every angle. If I were you, I’d first visit the Old Town during the day to snap the thin, cobbled streets, religious buildings and quaint squares. Don’t miss the 3 gates, the clock tower or the rather bizarre array of giant objects either – including a washing line, bench and lampshade! I’d then visit the Old Town again during the evening, when the place comes to life under the subtle hues of twinkling street lights and gentle live music emanating from the many restaurants. 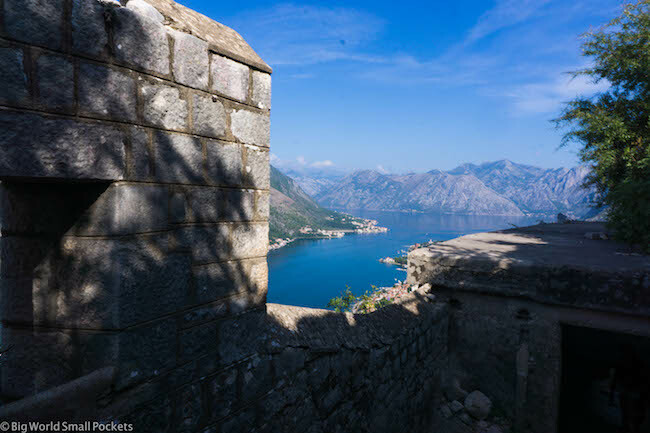 The next absolute must do thing in Kotor is the hike to the Fortress. Situated above the city, it’s almost impossible to miss this imposing set of ruins! What it is harder to miss however, is the 8 euro entrance fee – which is a complete rip off for somewhere that has amazing views, yes and is old, yes, but doesn’t have any signage, museum, exhibition or whiff of curatorship! But don’t fear budget travellers there is a free way to get into this fortress. Walk the clear trail to the left of the fortress walls (as you gaze up at it) and when you get to the second rest house (which doubles as a cheese shop) you take the trail towards the fortress walls. Climb through the window and you’re into the fortress for free! Spending a while ogling at the amazing views and snapping some serious selfies, before descending through the paying entrance gate (for free!) and heading down into the heart of the Old Town. Every morning until around 1pm, a farmers market is held just outside the gate of the Old Town in Kotor. 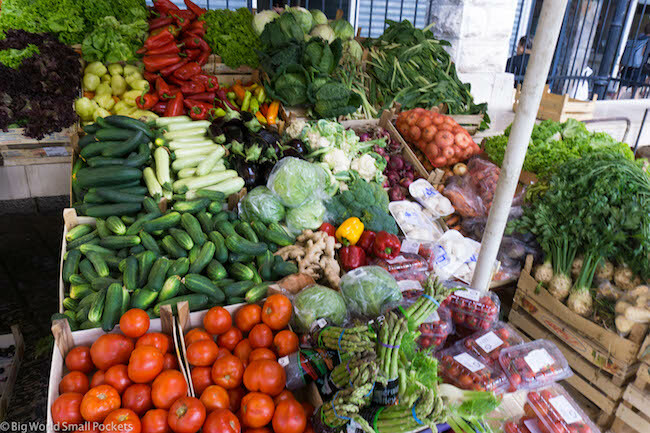 Head here to buy some yummy fresh produce including figs, grapes, tomatoes, nectarines, olives, cheese and more. 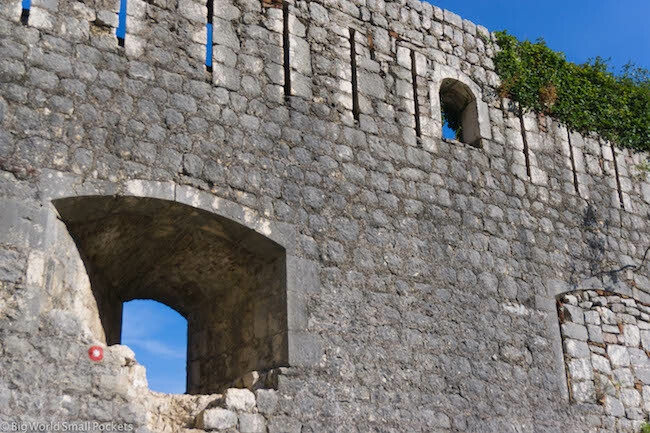 For just a few euros you can also wander the Old City walls of Kotor – definitely one of the best things to do in this city. As with the fortress, I’d tackle the climb either during the early morning or at sunset. Not only are the crowds less at this time, but so are the temperatures! 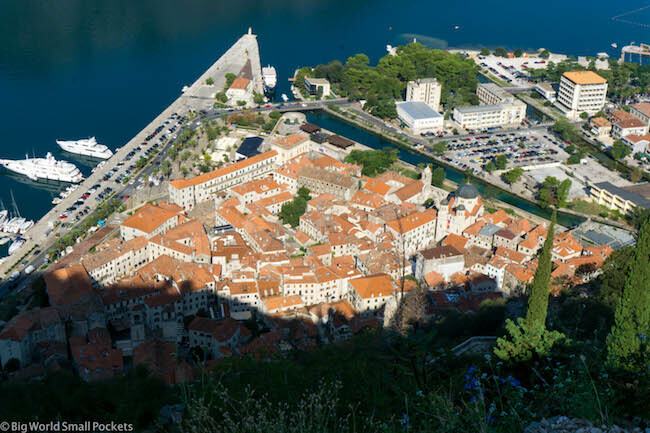 What could be more delightful than soaking in the beauty of Kotor from afar? While if you rent a kayak and head out into the Bay of Kotor, you can do just that. Plus, cruising these peaceful waters has to be one of the biggest treats ever! Ok so there’s not a huge sandy beach in the Bay of Kotor, but there are some pebbly patches where you can spread out your towel with the locals and soak in some of those rays, as well as soak in the sea too! In fact, just a short walk from Kotor’s Old Town, there’s a great public beach and swimming area. Otherwise, if you feel like exploring a little further afield, the “suburb” of Dobrota, has some quite places to recline by the water amidst slightly upmakert cafes. There are tons of day trips you can make from Kotor, which is why I highly recommend giving yourself more time that you might think this small town deserves. 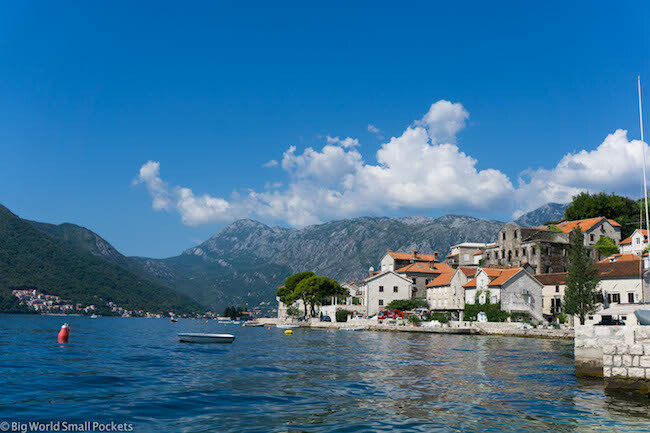 You can learn more about independent adventures to destinations such as Budva, Perast and Cetinje in the day trip section I’ve written below. Otherwise, do check out Monte360 who organise a range of backpacker-style day trips to destinations further afield in Montenegro such as Durmitor National Park. Priced around 45 euros for the day – all transport is included, which means having to think for yourself is minimal. If this is your idea of a holiday, you could be onto a winner! However if, like me, these prices are out of your range, and you quite enjoy thinking, then day trips by local bus and bicycle are easy and enjoyable to make. Heck you can even get to Dubrovnik for the day on a local bus if you’re feeling super energetic! I’d honestly advise staying at least 3-4 nights in Kotor – there’s a lot to see and do in and around the town and it also makes for a nice Montenegro base if you want to venture further afield. 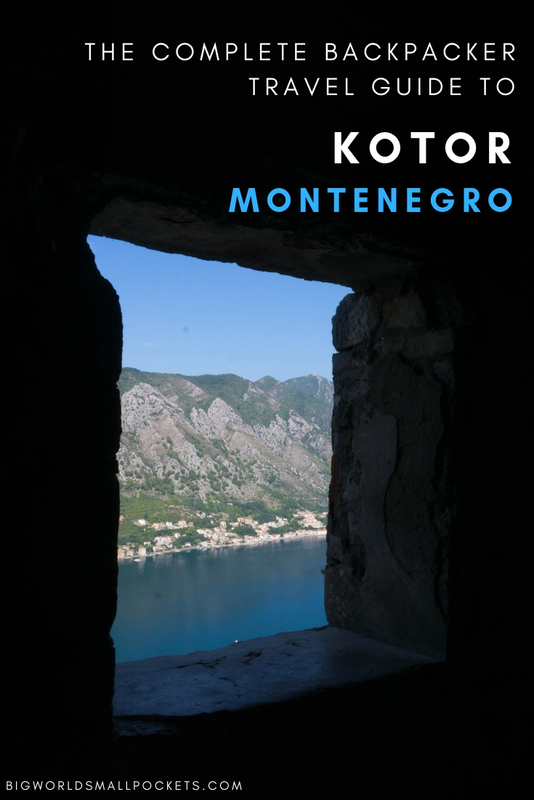 As I said, Monte360 is a local tour company that offer day trip adventures from Kotor across the country, so factor in a few more days if you want to take advantage of seeing more of Montenegro with Kotor as your base. Hike up to the Fortress early in the morning via the free track and then wander back down through the Old Town. 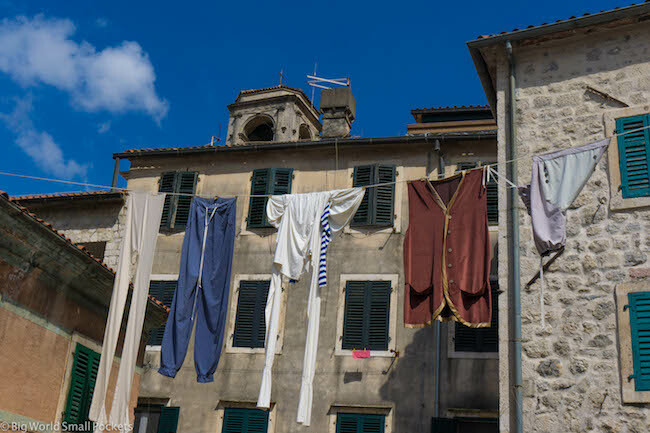 Spend the rest of the morning exploring the historical centre of Kotor, as well as the local cafes, shops and markets. In the afternoon, stroll along the foreshore to sunbathe and swim at Kotor’s public beach, before heading back into the Old Town during the evening for dinner and some picturesque moonlight snaps. Hike a bike or kayak and set out to explore the Bay of Kotor – the name given to the whole inlet in this part of Montenegro. Cycling is possibly the whole way round – care of a handy ferry crossing and makes for a wonderful excursion. See more in the day trip section below. Otherwise, why not hire a kayak and explore the beautiful Adriatic waters and views with the help of a paddle/oar? Boat rides to the Blue Cave, and evening booze cruises (if that’s your thing) are also a great way to get out on the water and see more the surrounding area. Why not venture out of Kotor and check out more of Montenegro such as nearby Lovćen National Park or the former capital of Cetinje. You can take a day trip which includes these destinations, as well as the busy and built up coastal resort of Budva if you want to have the easy option, care of Monte 360. Or use local buses go to both Cetinje and Budva – an easy loop that will make a great day trip. Budva is the place to head if you want an afternoon split between beach and bar, while Cetinje offers monasteries, museums, history and heritage – a winning combination! Buses to Cetinje from Kotor run hourly during the summer and from there to Budva, it’s just 40 minutes. Buses from Budva back to Kotor run half hourly during the summer months and all bus rides cost just a few euros. With a big Italian influence (it’s just across the water! ), eating in Kotor tends to be dominated (at least during the summer) by alfresco pasta and pizza options. However, the new and funky Hoste in the Old Town provides some welcome relief with funky vegetarian dishes, yummy snacks and a relaxed café vibe. They also do good coffee, have free wifi and an outside seating area! The next best coffee in town can be found almost next door to Hoste at O Clock Café. If you are looking to eat out in the Old Town, Pasteleria comes highly recommended and for drinks the Pub “Old Town” Kotor and Letrika are backpacker favourites. Otherwise, do as I did and make sure you stay at a hostel in Kotor with a kitchen. Both the daily farmer’s market – held just outside the walls of the Old Town every morning – and the nearby Idea Supermarket are well stocked and cooking your own meals is therefore cheap and easy. With a great location very nearby to the Kotor bus station and boasting marina views, Pupa Hostel is brand new on the Kotor backpacker scene and it shows. Dorms are large but clean, and each bed has a curtain, reading light and charging station. There’s a kitchen too, super-fast wifi and some very friendly, helpful staff. 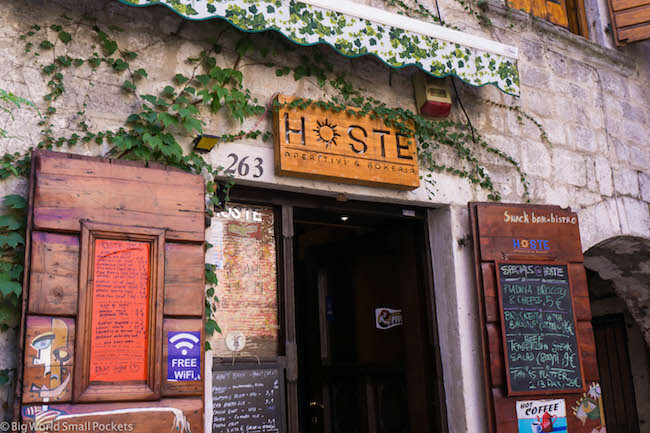 A party hostel full of young, energetic things, Old Town Hostel is a firm Kotor favourite, situated in the heart of the Old Town. There’s a kitchen and a pool here (both big drawcards) and the backpacker tour agency Monte360 is connected with them too. Organising daily activities this is a great place to stay if you want to meet others and enjoy the Kotor nightlife. With more of a boutique feel, Stranger Tides is a newly renovated property has just diversified into the backpacker market, offering something of a quieter retreat from the crowds in the nearby suburb of Dobrota. While this does mean a bit of a walk into the Old Town and the bus station, as well as shops, there’s plenty of delightful coastline to occupy you here, as well as a few upper-market style cafes and restaurants. This would be the perfect place to stay if you want to relax in peace and quiet. Right on the beach and close to the old town, Montenegro Hostel 4U seems to combine the best of both worlds. That said it does attract a younger crowd, which put boring old me off, but the location is really hard to beat and they continually get top reviews. As such, this place fills up quickly, so do book ahead of time if you want to stay here. Party is definitely the name of the game! There are 2 independent day trips you can make from Kotor that I highly recommend. First up is cycling the Bay of Kotor. Yes the whole way round! It actually is much shorter than it looks and easily doable in a day – including swimming, sunbathing, coffee, lunch and ice cream stops! Heading out of Kotor in a clockwise direction is the easiest way round to make the loop when it comes to ascents, and don’t forget you can hop across the small channel on the ferry with your bike too. Bikes can easily be rented just outside the East Gate of the Old Town – 10 euros for 24hrs. And then you’re off cycling to your heart’s content. 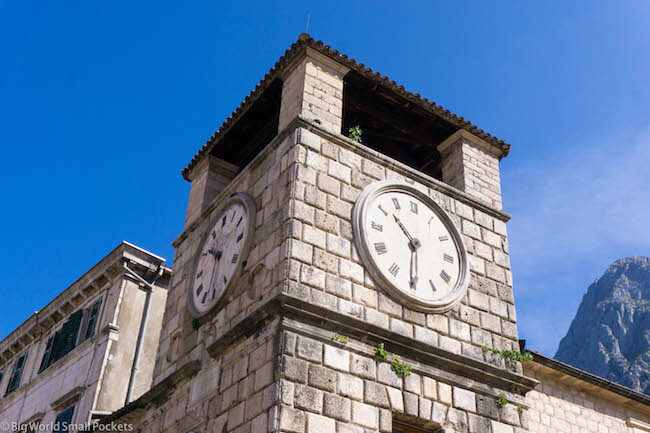 If you only have time for one stop you must make it Perast – read on to learn more! But if cycling isn’t your thing, then you can also use the local Blue Lines bus service to get to the star attraction of the bay (aside from Kotor) and that is the pretty town of Perast. The Blue Lines bus leaves hourly (roughly) from Kotor and takes around 20 minutes to reach Perast at a grand old price of 1 euro. When in Perast, it’s all just about wandering the tiny foreshore of this cute town, enjoying the views, having a coffee / burek and taking a dip then drying out via one of the coastal platforms. There’s also an island you can visit just out from Perast. A boat ride there and back will cost you 5 euros and entrance to the island is free. The captains normally give you half an hour to wander round the island with its Orthodox Church and a small museum (museum entrance 1.50 euro). But, to be honest, the real reason to take this boat trip to enjoy the, albeit short, experience of sailing on the Adriatic and also to take in, and snap, the views of Perast from a watery distance. 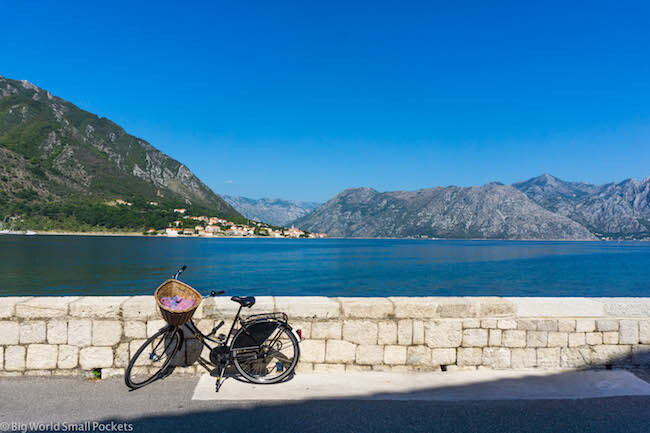 Another option is just to cycle to Perast and back rather than peddle the whole bay – this will be quicker, as the ride to Perast from Kotor is less than 1 hour. 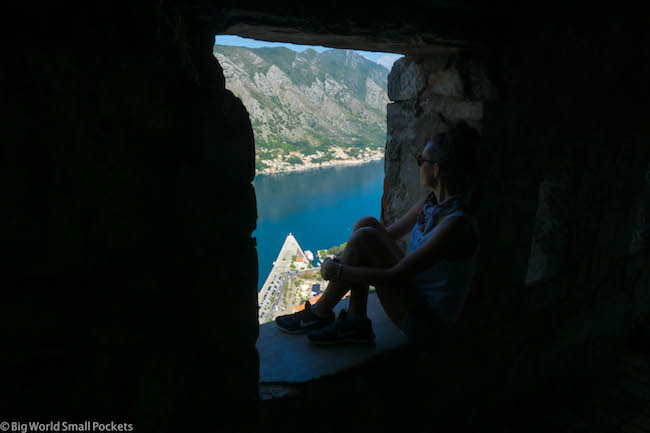 And my third day trip recommendation when it comes to the best things to do in Kotor is to make a DIY day trip south to the central coastal area of Montenegro. 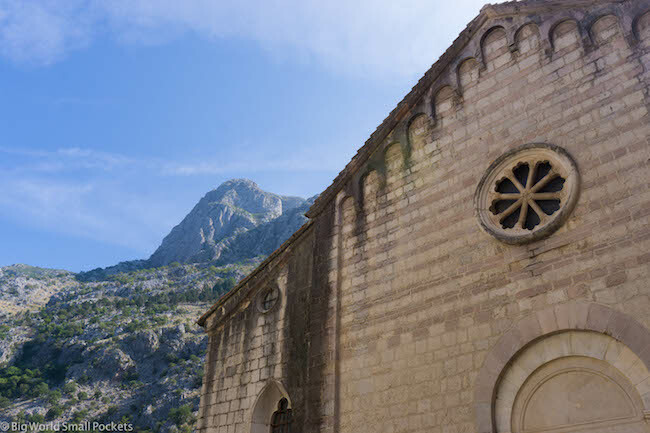 Start by hopping on one of the hourly buses from Kotor to Cetinje and spend an hour or 2 strolling round this historic capital and its interesting streets. Then board a regular bus to Budva and spend the afternoon soaking up the rays with the crowds on Montenegro’s most popular beach resort. Hit the bars in Budva for sunset, before heading back to Kotor on an evening bus. This is a great way to see a little more of Montenegro without having to fork out tons of euros unnecessarily! 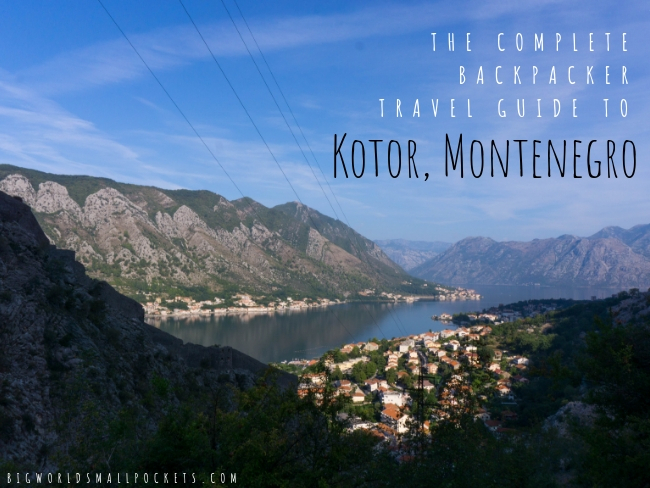 So there you have it, my complete backpacking guide to Kotor in Montenegro. Have you decided on the things to do in Kotor you’re going to be enjoying soon? Heck, why not enjoy them all! Really does a good job, we have always found their tours to be very well done. Thanks! Kotor looks so good! I am expecting to go to Dubrovnik next year but it was between that and Kotor! Hi Craig – it’s a tough one to decide between the two. That said, both are close together so it is possible to day trip from one to the other, which does allow you the best of both worlds. Croatia is more expensive than Montenegro and has less tourists, but it just depends what you’re looking for. Either way, enjoy!